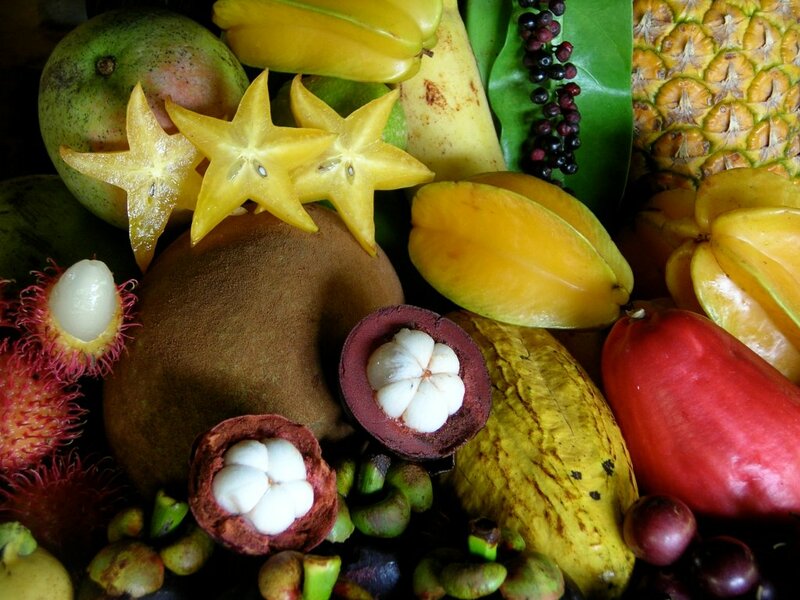 Share the post "Exotic Fruits Of Asia: India, Cambodia, China, And More. Part 1"
When traveling to other countries, you always find many interesting fruits, you’ve never seen before and probably not sure how to eat them. We are absolutely lucky to have such a wide variety of delicious and exotic fruits that Mother Nature has to offer. Here we would like to talk about different weird and exotic fruits from Asia that can open up an entirely new world to you. There are probably many more, which we didn’t include in this list, so you can add them in the comments below. We are looking forward to it! What is Jackfruit? 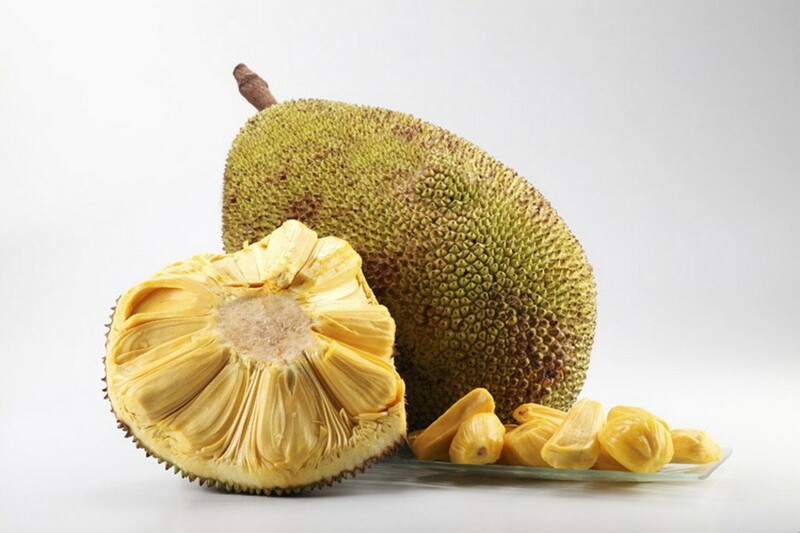 The jackfruit (Artocarpus heterophyllus), also known as jack tree, jakfruit, or sometimes simply jack or jak is a species of tree in the mulberry and fig family (Moraceae). How does it taste? Jackfruit have a distinctive, sweet and fruity aroma. The flavor is comparable to a combination of apple, pineapple, mango, and banana. How to eat? Except for the skin and the central stem, everything else is edible: slice open the monstrous yellow orbs, hack out the fleshy bulbs of the inner part of the fruit and eat them. Jackfruit a ‘miracle’ crop: it’s versatile. It could be eaten raw or cooked, young or ripe. Ripe jackfruit is naturally sweet with subtle flavoring. Unripe jackfruit has a meat-like taste, so it can be shredded, seasoned, cooked, and served up as an alternative to meat. Jackfruit seeds and fruit could be dried out, ground up and made into flour. It is also added to curries, stir fry, juice, chips, and ice cream. Jackfruit is a frequent ingredient in sweets and desserts. Interesting facts: Jackfruit is the national fruit of Bangladesh, by name Kathal in Bengali language. It is also the state fruit of the Indian states of Kerala and Tamil Nadu, one of the three auspicious fruits of Tamil Nadu, along with the mango and banana. – It is nutritious: the flesh is high in calcium, iron, vitamin B6, and potassium, and the seeds are good sources of protein. – It gives energy, protects colon mucous membrane, helps in easy digestion by clearing the bowel movement. Anti-oxidants and vitamin C present in the jackfruit increase the resistance of the body to fight against infectious agents and free radicals. Extracts from the roots of the jackfruit plant control asthma, and the iron content of the fruit keeps anemia away. It also has anti-cancer and anti-aging properties and many others. What is Chikoo? Manilkara zapota, commonly known as the sapodilla, is a long-lived, evergreen tree in Sapotaceae family. Chikoo, also known as sapodilla, sapota, níspero, chico, ciku, sapathilla or rata-mi, sawo, saos, lamoot is a popular tropical fruit whose exterior resembles the kiwi. Big inedible seeds located at the center of the fruit. How does it taste? The fruit should be fully matured to eat. The ripe fruit has an exceptionally sweet, malty flavor. The taste of Sapodilla can be compared to some extent to sweet pears. The unripe fruit is hard to the touch and contains high amounts of saponin, which has astringent properties similar to tannin, drying out the mouth. How to eat? Skin and seeds of the fruit are not edible. Soft, easily digestible pulp made of simple sugars like fructose and sucrose. Chikoos are most often eaten fresh. It is also used to make smoothies and shakes, and in various desserts and sweets. Interesting facts: In Mexico, sapodilla is grown commercially for making chewing gum. 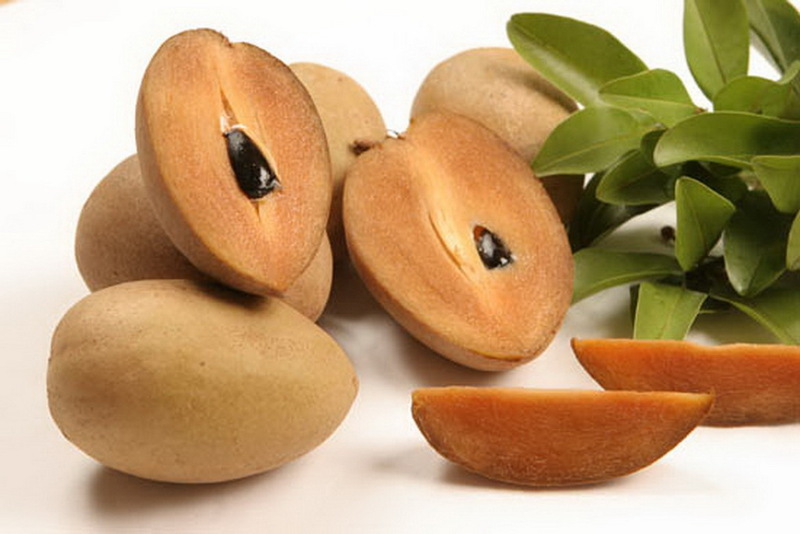 Sapodilla is one of the high calorie fruits. It is known for its cholesterol-lowering effects. It contains Vitamin A and Vitamin C. In Ayruvedic practice Chikoo is used for its anti-inflammatory benefits. It is also a good source for dietary fiber. The natural tannins of the Chikoo are antioxidants and have anti-bacterial, antiviral, and anti-parasitic effects. Fresh ripe sapodilla is a good source of minerals like potassium, copper, iron and vitamins like folate, niacin and pantothenic acid. Sapodilla or chikoo is a natural sedative. What is Guava? Psidium guajava (common guava, lemon guava) is a small tree (also known as evergreen shrubs) in the Myrtle family (Myrtaceae). Another terms for guavas is peru, amrood. How does it taste? Guava has a pronounced and typical fragrance, similar to lemon rind but less sharp. The outer skin may be rough, often with a bitter taste, or soft and sweet. Varying between species, the skin can be any thickness, is usually green before maturity, but becomes yellow, maroon, or green when ripe. The pulp inside may be sweet or sour and off-white (“white” guavas) to deep pink (“red” guavas). The seeds in the central pulp vary in number and hardness, depending on species. How to eat? In many countries, guava is eaten raw, typically cut into quarters or eaten like an apple, whereas in other countries it is eaten with a pinch of salt and pepper, cayenne powder or a mix of spices (masala). 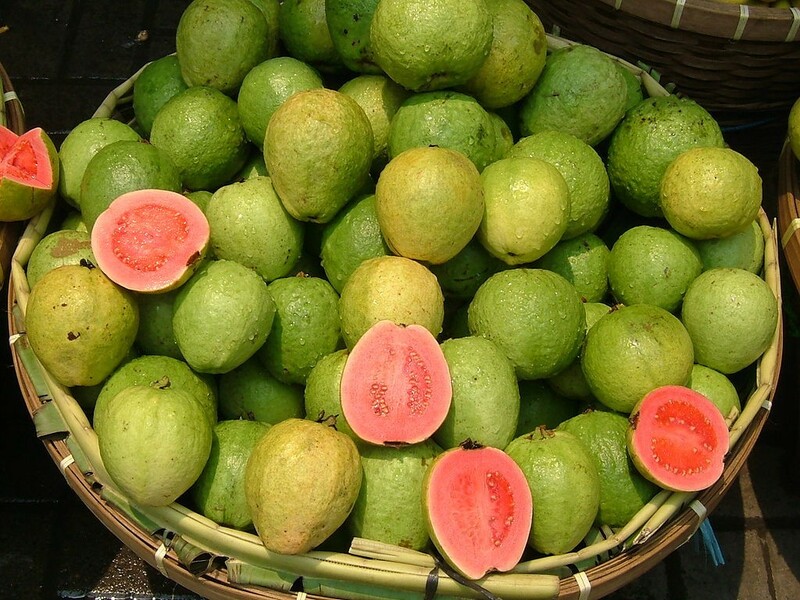 Guava is used in juices and beverages, prepared in fruit salads. It can be baked, sautéed, caramelized and pureed, preserved and jammed. Because of its high level of pectin, guavas are extensively used to make candies, preserves, jellies, jams, and marmalades. Red guavas can be used as the base of salted products such as sauces, substituting for tomatoes, especially to minimize acidity. Interesting facts: Guava is known as the winter national fruit of Pakistan. – Guavas are rich in dietary fiber and vitamin C, with moderate levels of folic acid. Guava fruit contains about four times the amount of vitamin C as an orange. Guava seed oil is a source of beta carotene, vitamin A, vitamin C, copper, zinc and selenium. – The health benefits of guava include the treatment of diarrhea, dysentery, constipation, cough, cold, skin care, high blood pressure, weight loss and scurvy. What is Amla? Phyllanthus emblica, also known as Emblica officinalis, emblic, emblic myrobalan, myrobalan, Indian gooseberry, Malacca tree, or amla from Sanskrit amalika, is a deciduous tree of the family Phyllanthaceae. It is known for its edible fruit of the same name. How does it taste? The taste of Indian gooseberry is sour, bitter and astringent, and it is quite fibrous. How to eat? The amla fruit is eaten raw or cooked into various dishes. In India, it is common to eat gooseberries steeped (pickled) in salt water and turmeric and other spices to make the sour fruits palatable. It is also used to make sweets. Interesting facts: Amla is unusual in that it contains five out of the six tastes recognized by Ayurveda: sour and astringent in taste, with sweet, bitter and pungent secondary tastes. The tree is considered sacred by Hindus as the Vishnu is believed to dwell here. – All parts of the plant are used in various Ayurvedic/Unani medicine. The amla fruit is a rich source of vitamin C. It is also known to contain ETs and other polyphenols, including emblicanins A and B.4. – Amla is used for the treatment of liver diseases, stomach ulcers, inflammatory diseases, and also to inhibit tumor growth, in diabetes and in geriatric complaints. It has antiviral and antimicrobial properties, enhances food absorption, balances stomach acid, supports the heart, strengthens the lungs, regulates elimination of free radicals, enhances fertility, helps the urinary system, increases skin health, promotes healthier hair, flushes out toxins, increases vitality, strengthens eyes, acts as an antioxidant. 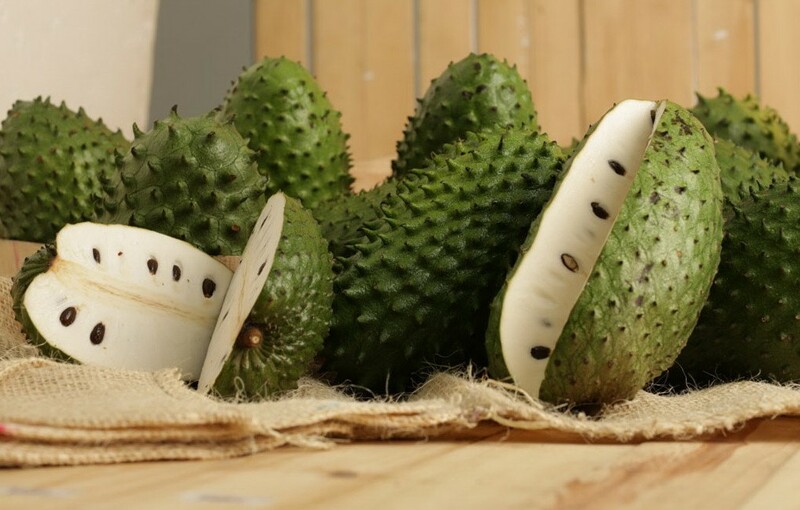 What is Soursop? Soursop is the fruit of Annona muricata, a broadleaf, flowering, evergreen tree. Other common names include: Brazilian pawpaw, guanábana, corossol, graviola, durian benggala, tearb barung, sirsak, zuurzak, and Mullatha. How does it taste? The flavour has been described as a combination of strawberry and pineapple, with sour citrus flavour notes contrasting with an underlying creamy flavour reminiscent of coconut or banana. Soursop has a leathery, bitter, inedible skin, with elongated, soft, pliable ‘spines.’ The skin will change in color from a dark green to yellow-green as the fruit ripens. The flesh of the fruit consists of an edible, white/cream-colored pulp, some fiber, and a core of indigestible, black oval seeds. How to eat? The pulp of soursop is eaten ripe, or used to make juices, smoothies, fruit juice drinks, as well as candies, sorbets, and ice cream flavorings. – The fruit contains significant amounts of vitamin C, vitamin B1 and vitamin B2 and high in carbohydrates, especially fructose. Calcium, magnesium, zinc, potassium, and phosphorous have also been identified. – The seeds, fruit, and leaves have been used traditionally for stomach problems and fever, and as a sedative. Warning: People with established Parkinson disease should avoid consumption of the fruit. The compound annonacin, which is contained in the seeds of soursop, is a neurotoxin associated with neurodegenerative disease. What is Langsat? Lansium parasiticum, also known as langsat, lanzones, lanzón, langsad, longkong is a species of tree in the Mahogany family. How does it taste? The sweet and sour taste of langsat has been likened to a combination of grape and grapefruit and is considered excellent by most. The fruit can be elliptical, oval, or round, and look much like small potatoes and are borne in clusters similar to grapes. The larger fruits are on the variety known as duku. It is covered by thin, yellow hair giving a slightly fuzzy aspect. The fruit contains 1 to 3 seeds, flat, and bitter tasting. The sweet juicy flesh contains sucrose, fructose, and glucose. For consumption, cultivars with small or undeveloped seeds and thick aril are preferred. The fruit can be quite sour when unripe, but is perfectly sweet when ripe. How to eat? Its skin is thin and easy to peel with a simple twist of the thumb and index finger. 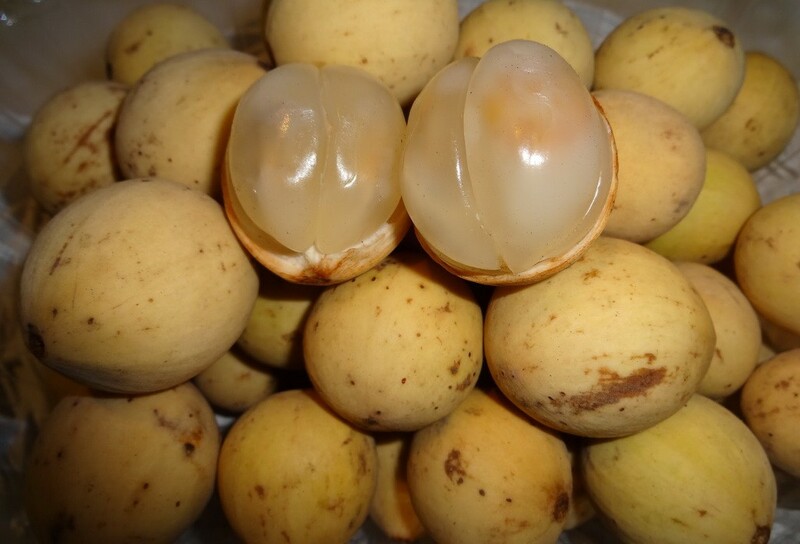 Unlike duku, langsat fruit does not last long after being picked. Three days after being picked, the skin blackens; this does not affect the fruit’s taste. Langsat fruit can be eaten raw or can also be bottled in syrup. Interesting facts: It is the provincial flower for the Indonesian province of South Sumatra. – The fruit contains many vital elements like proteins, carbohydrates, minerals, vitamins and dietary fiber. It is rich in vitamin A, thiamine, riboflavin, which can counter migraine and niacin, which reduces “bad” cholesterol and increases “good” cholesterol in the blood. It contains the mineral nutrients calcium, iron and phosphorous. – Some parts of the plant are used in making traditional medicine. The bitter seeds can be pounded and mixed with water to make a deworming and ulcer medication. The bark is used to treat dysentery and malaria. The powdered bark can also be used to treat scorpion stings. The fruit’s skin is used to treat diarrhea. Interesting facts: In the Philippines the dried skin is burned as a mosquito repellent. The skin, especially of the langsat variety, can be dried and burned as incense. 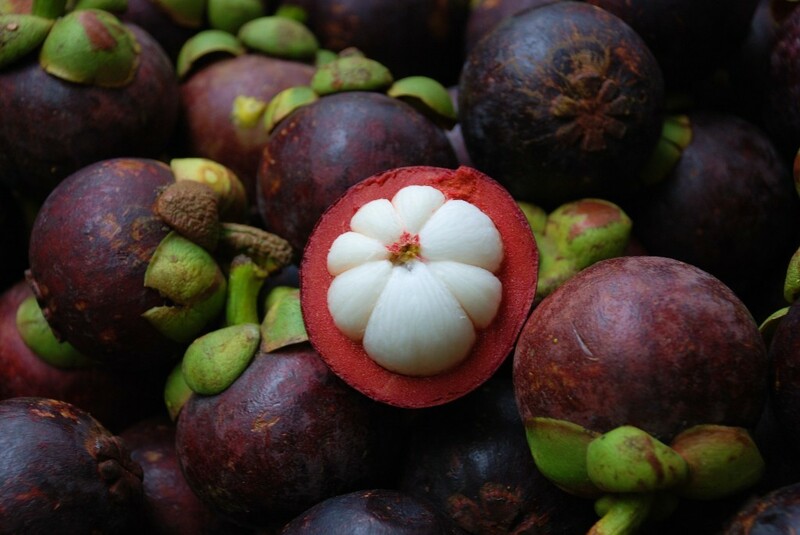 What is Mangosteen? The purple mangosteen (Garcinia mangostana), commonly known as mangosteen, (‘Mangustan‘ in Hindi, ‘Ivarumamidi‘ in Telugu, ‘Kaattampi‘ in Malayalam, ‘Kao‘ in Bengali, ‘Murugala Hannu‘ in Kannada, ‘Kokum‘ in Gujarati, ‘Kokam‘ or ‘Ratamba’ in Marathi) is a tropical evergreen tree. How does it taste? The fruit is sweet and tangy, juicy, somewhat fibrous, with fluid-filled vesicles (like the flesh of citrus fruits) and mild aroma, with an inedible, deep reddish-purple colored rind (exocarp) when ripe. The fragrant white flesh that surrounds each seed is botanically called endocarp, and it is edible. Seeds are almond-shaped and sized. The seeds are somewhat soft and should not be eaten as they are bitter. If the exocarp is soft and yielding as it is when ripe and fresh from the tree, the fruit is usually good. When a mangosteen is very fresh, the seeds are white inside. As the rind hardens (because it loses moisture), the seeds start to turn brown and this could be a rough indicator of how long the fruit has been off the tree. How to eat? To open a mangosteen, make a shallow cut around the equator of the fruit wiht the knife, trying to avoid cutting into the soft interior. Then twist the fruit with both hands along the cut. Pull the halves apart along the crack and take the pulp out with the fork (the white flesh is very slippery). Sometimes, when peeling ripe fruits, the purple exocarp juice may stain skin or fabric. Mangosteens are eaten fresh, juiced and dried. They can be frozen or canned but it will compromise the flavor and favorable texture of the fruit. The mangosteen fruit is used in baked goods, custards, ice creams and beverages. Mangosteen contains more than 40 biologically-active, natural chemical compounds called Xanthones, as well as other potent natural compounds like catechins, polysaccharides, quinones, stilbenes and polyphenols. Calcium, phosphorus, iron, thiamine, riboflavin, niacin, and ascorbic acid are found in mangosteen. Mangosteen possesses possible antioxidant, anti-inflammatory, anti-fungal, anti-bacterial, anticancer, and antihistamine properties, antiplatelet aggregation, antithrombotic, and vasorelaxant activities as well as it is considered to be good for the heart and immune system. But everything is good in moderation: one case report documents a 58-year-old man ingesting mangosteen juice daily for 12 months as a dietary supplement who developed severe lactic acidosis.